MACON, Ga. - Hope sealed Furman football's 14th Southern Conference championship Saturday. Hope is also what the Paladins still have for an at-large bid to the FCS playoffs. Mercer looked to have one Hail Mary throw to the end zone on the final play of the game Saturday, but Furman freshman Adrian Hope sacked quarterback Kaelan Riley as the Paladins held on for a 35-30 win. 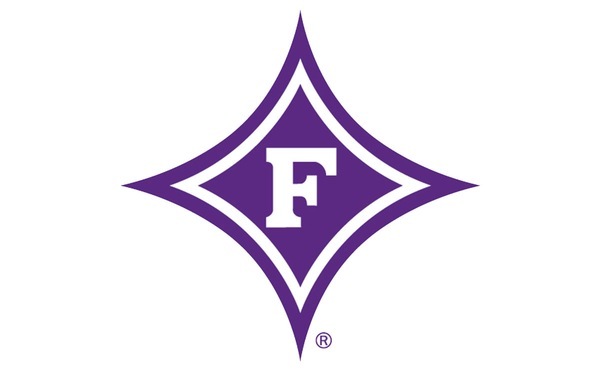 Furman's win created a three-way tie for the SoCon crown between the Paladins, ETSU and Wofford. Furman (6-4, 6-2) needed to hold Mercer to 16 points or less to secure the tiebreaker for the autobid. 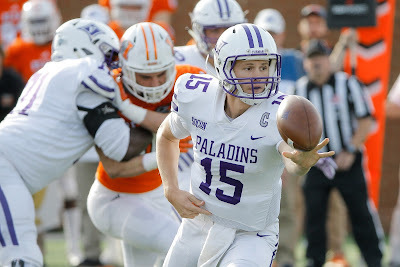 Those hopes ended on the first play of the second half when the Paladins allowed their third fumble return for a touchdown this season. While Furman will nervously watch the FCS playoff selection show Sunday at 12:30 p.m., Paladins coach Clay Hendrix believes they deserve an at-large bid. "This bunch is deserving. We lost a (cancelled) game and we played a brutal schedule," Hendrix said. "One thing in our league is that everybody plays everybody. You don't get to not play the best teams. We're conference champions, so I'll live with whatever happens but we ought to be playing. I hope we get that chance." In order to be in a position for a three-way tie for the title, Furman needed an ETSU loss to Samford Saturday. By the time the Paladins took a 20-10 lead into halftime, they were fully aware that that happened. They also knew they were faced with having to hold the Bears (5-6, 4-4) to no more than six points the rest of the way. Hendrix told his team simply to focus on the task at hand. "I was told at half about the other score and I went immediately to our kids and said, 'Look, this is the deal. I don't want to hear another word. Let's go win a conference championship,' " Hendrix said. "I knew what the point thing was but I didn't really care about that. I just wanted to win a championship and I'm proud of our bunch for hanging in there and doing it." Furman put up 245 yards rushing Saturday, as senior captain Harris Roberts directed some big gains off the option. But on the first play of the second half, Devin Wynn couldn't handle the pitch and Mercer's Sidney Otiwu returned the fumble 12 yards for a touchdown. While Furman went three-and-out on its next possession, the Paladins recaptured the momentum with a 10-play, 95-yard drive that was capped by a 24-yard touchdown pass from Roberts to Ryan DeLuca. Later in the third quarter, Hope had a sack and forced a fumble that Jaylan Reid recovered. That led to a 42-yard field goal by Grayson Atkins. Atkins' 11th consecutive made field goal pushed the lead to 29-17. But Bobby Lamb's Bears didn't quit. In a scene all too similar for Furman to the ETSU game earlier this season, Mercer called on former starting quarterback Riley on its next series. In the SoCon opener eight weeks earlier, ETSU trailed Furman 27-6 in the third quarter when it turned to former starting quarterback Austin Herink following a turnover. Herink led the Bucs to a 29-27 comeback win. Riley came in Saturday and marched the Bears right down the field on a 75-yard scoring drive in 2:49. It ended on the 2017 SoCon Freshman of the Year's 11-yard touchdown pass to Marquise Irvin. After Furman went three-and-out, Mercer put together a 67-yard scoring drive in 2:35. Riley's 24-yard touchdown pass to Tyray Devezin gave the Bears a 30-29 lead with 11:37 left in the fourth quarter. Furman came up with a big stop of Devezin - who rushed for 185 yards - on the two-point conversion. Unfazed, Furman's offense answered as Roberts completed 5-of-5 passes on its ensuing possession. Those were wrapped around Carson Maples two-yard gain on fourth-and-one near midfield. Roberts fifth touchdown pass of the game went for 11 yards to Jake Walker, putting Furman back ahead 35-30 with 6:52 left. "It's been a year of adversity. Throughout that team has grown and matured, and we certainly had our share tonight too," Hendrix said. "The score to go up and then the drive to put us in position to punt it down there and start them in their five, and then our defense just coming up with big, big plays. It took a total team effort and that's what we had." After Furman's defense forced a three-and-out, the Paladins drained 4:24 off the clock before punting it back to the Bears. The Paladins had tremendous coverage on Atkins' kick and tackled Irvin at the nine-yard line. A personal foul backed Mercer up to start at its own four-yard line with 1:28 left. The Bears pulled off 12 plays and went 50 yards in those final 88 seconds before Hope's sack and second forced fumble ended it, setting off a massive celebration by Furman. "It was a storybook moment," Hope said. "You can't even make this stuff up." Hope finished with 2.5 sacks Saturday giving the freshman reserve bandit 15 this season. That moved him into third-place on the school's single season sack ledger, a half-sack ahead of Kelly Fletcher in 1988 and one shy of Fletcher's 1989 total. Roberts completed 16-of-23 passes for 189 yards with a career-high five touchdowns and no interceptions. The Paladins essentially ran between each 20-yard line then took to the air off play-action in the red zone. Devin Wynn had a career-high 28 carries for a career-high 135 yards, while Corey Watkins had a career-high 86 yards rushing. Roberts has overcome injuries to have a terrific senior season in his only year of taking significant snaps. Now he's just hoping it's not over. "We had a tough start to the season, but we just kept working to make Furman football better each week to get to this point," Roberts said. "We were able to handle a ton of adversity tonight and couldn't be more proud of the guys on this team. "I'd do anything for at least one more (game)."